1. Heat oven to 400 degrees F. Lightly spray both sides of each tortilla with non-stick cooking spray. Place on baking sheet and bake at 400 degrees F, 2 minutes on each side or until crisp and golden brown. 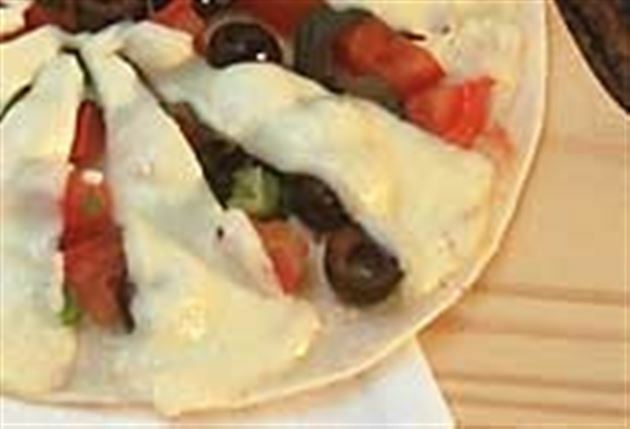 Remove from oven and reduce temperature to 350 degrees F. Top each tortilla with half the tomato, basil, onion, olives, and 12 wedges of cheese. Sprinkle with pepper to taste. Bake at 350 degrees F. for five minutes or until cheese melts. Enjoy this delicious pizza primavera Mexican recipe!